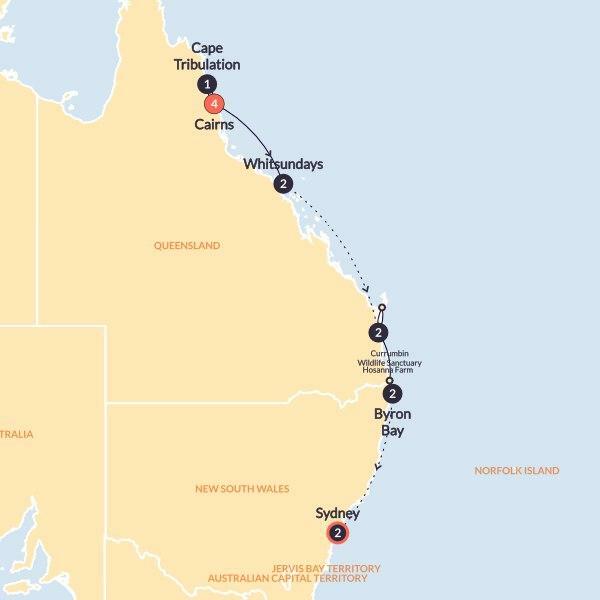 Wild nights & wildlife await you on Australia's East Coast. Zip through the rainforest canopies, experience the pristine beauty of sailing the Whitsundays as well as life on a farm, koalas & kangaroos and snorkelling on the Great Barrier Reef. Hit up Byron Bay, serving up some of the best surf, sand & beach vibes in the world. Say hello to your group this morning and head to our first destination as we depart Cairns for Cape Tribulation. We'll stop at Alexandra Lookout for a quick photo op that is almost guaranteed to have the likes rolling in.Next we'll roll in to the remote coastal point of Cape Tribulation (make sure you ask your Crew how it got it's name) where we'll get to experience a bit more of life off the beaten track. Here you can opt to explore the world's oldest rainforest and zip-line through the canopies, before turning in (or turning it up) for your final night in Aussie. Rise and shine for your second day! After breakfast we'll take a guided walk up to a lookout followed by a visit to Marrdja Boardwalk. Making our way back to Cairns today, we stop in Port Douglas where you'll have free time for lunch and then we're back on the coach for our drive back into Cairns.Arriving back into Cairns in the late afternoon you'll get to meet more new-found friends to share your East Coast adventure with. Hostel-style accommodation with a Special Stay at an Eco Camp in the Noosa Everglades (complete with kangaroos). With accommodation this centrally located you'll be right in the action and ready to enjoy your days after a comfy night's sleep. We'll provide 19 of your meals and the rest are up to you. Food is an important part of any holiday so we want you to have all of the opportunities to explore modern Australian cuisine and local eats. Our TM's will always be on hand with their must-try meal recommendations.